Christmas has come and gone, but winter’s gonna be here for a couple more months! 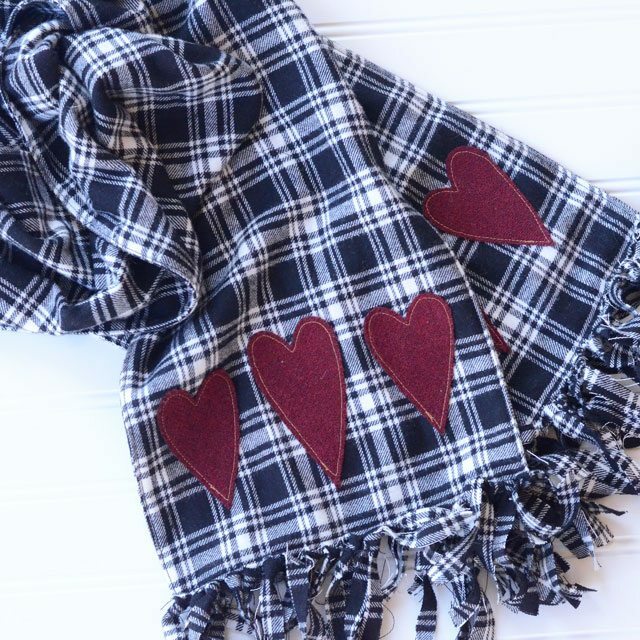 This flannel scarf will keep your neck warm when you’re out in the cold. The flannel is soft against the neck, and it’s made from two layers so it’s extra warm. 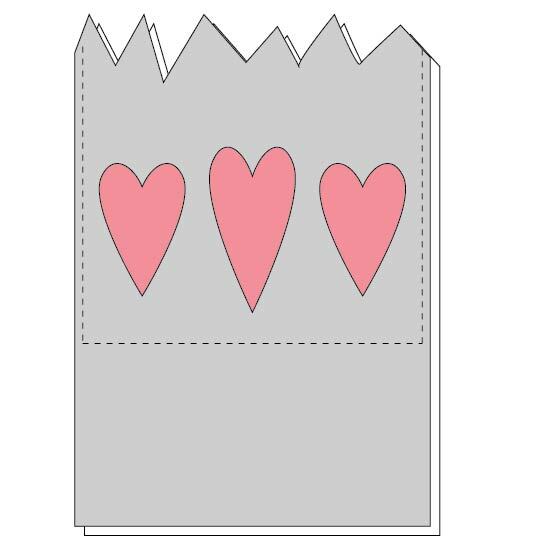 Make it from plaid and add some heart appliques across the bottom. The hearts are cute for Valentine’s Day, but they’re not so cutesy that you can’t wear it after Valentine’s is over. It’s actually pretty quick to make this flannel scarf, so if you’re a beginner sewist you can totally make this! The applique is easy to do with fusible webbing, and it takes just a few simple straight seams to sew the scarf. For the fringe, you can do what I did and make super fast tied fringe. Or, for a nicer finish, you can pull threads to create a soft fluffy thread fringe. 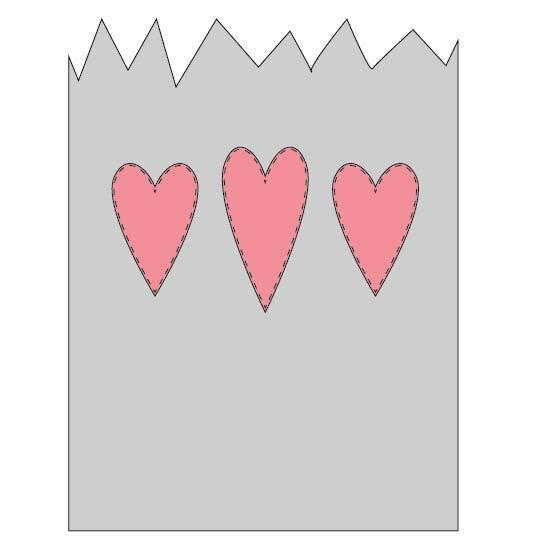 Trace the heart designs to the back of your fusible webbing. You’ll need 4 of the small heart and 2 of the large heart. Follow manufacturer’s instructions to fuse the fusible webbing to the back of your wool. 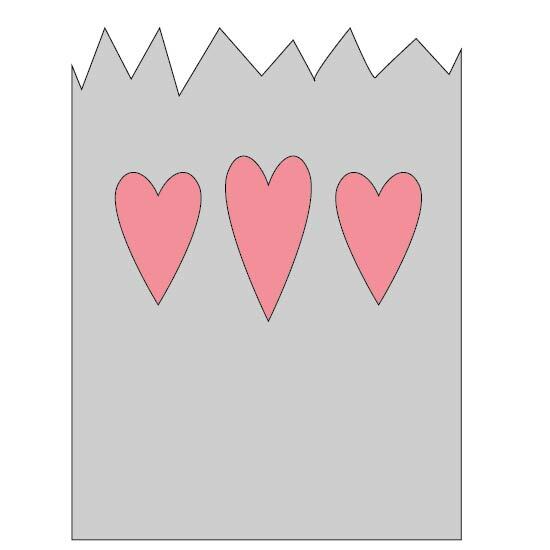 Cut out the hearts and remove the paper backing. Lay one of the scarf pieces right side up. 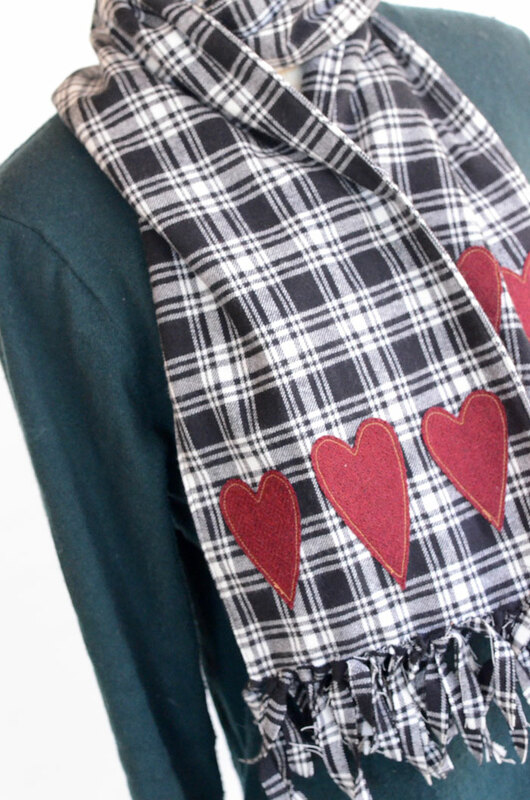 Use the placement guide to place the felt hearts at both ends of the scarf. 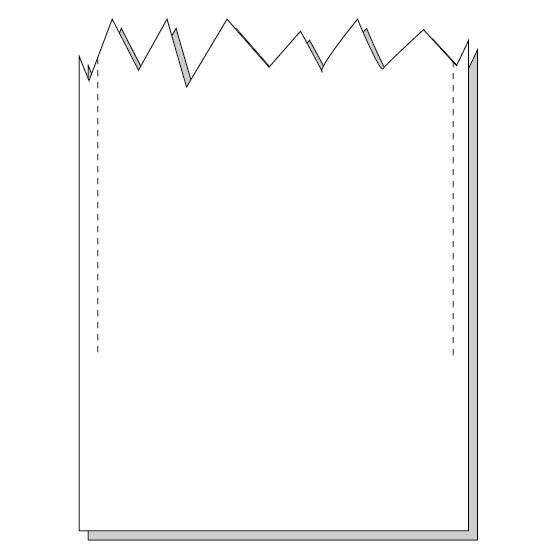 The bottom of the placement guide should be 4” from the end of the scarf. Fuse the hearts down in place. 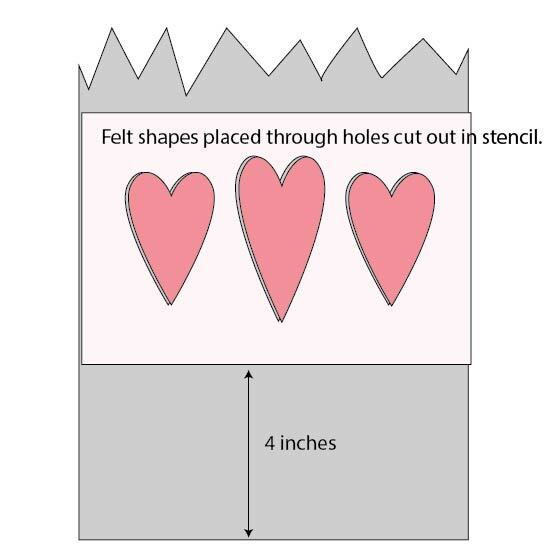 If you cut out the shapes drawn on the template to create a stencil, you can get exact placement of the felt hearts by placing them through the cut out areas and then removing the stencil. It works best if you do one shape at a time to prevent shifting. Top stitch around the hearts to secure. Place the two long flannel pieces right sides together. Pin along long sides. Sewn down both long sides with 1/2” seam allowance, starting and stopping 4” from the ends. Do not sew the ends. Top stitch down the long sides close to the edge, sewing across the scarf when you reach the ends where the sides are open. For quick fringe, just cut the ends of the scarf (up to where you stitched across) into 3/8” wide fringe. Knot if desired. The edges of the fringe will fray a little but it won’t be that noticeable. This is the option I used. For more luxurious (but more time-consuming) fringe, you can pull the horizontal threads to create a soft fluffy fringe. This will take a while, and you may want to trim the ends first to create shorter fringe (and save yourself some time!). Your flannel scarf is finished! Looks so cozy!! Love the hearts. 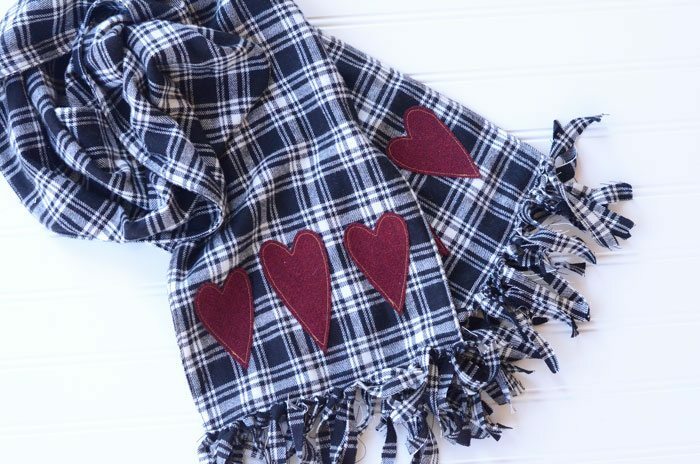 Super sweet scarf! This is my type of sewing project — easy! !